My DREAM &quot;Salt Water Taffy&quot; Seashore house! 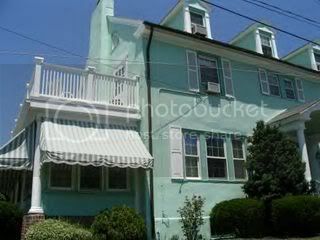 My DREAM "Salt Water Taffy" Seashore house! Finally settling down after a week full of school projects, cross country, and hockey games, Dr. visits, shipping, designing, and planning! It seems Aaron has caught the bug..he has been feeling stinky for 2 days!..and I think it may be hitting me now! I am just hoping to get our new pieces listed before we truly become zombies!! We are super excited about our new pieces! They will be done much like our current Cake Art collection....painted distressed finishes, antique washes, fine hand glittering, original painting etc...but now will incorporate vintage photos!! We are so excited! We hope to have some listed by this weekend..on eBay and in our Glitter and Grunge boutique!! Stay tuned!! Now about the photos up top!! How amazing is this incredibly edible candy colored seashore house? 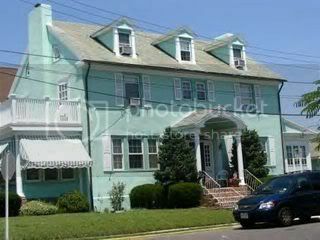 We came upon it while driving through Cape May N.J. during our mini Wildwood vacation! 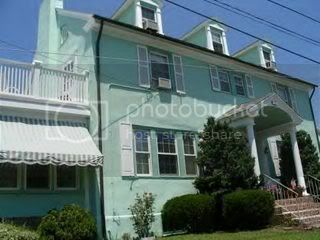 Cape May is home to the largest collection of authentic Victorian structures in the USA!! A post card of a town!! Amazing!! It is only mins. from Wildwood's retro, Doo Wop, kitsch....yet a completely different world! The moment I saw this mint green gem my heart and mind raced! Is the kitchen pink? Do they have a piano? What do they collect? Please tell me they have candy striped walls and pink damask wall paper! !....shelves of paper mache rabbit candy containers, hundreds of cardboard Christmas houses and pastel bottle brush trees..in a room dedicated to Christmas all year round!! Makes me think of all my summers spent locked away in my room..alone...picking homes from real estate brochures and "decorating" them room by room with J.C. Penney, Sears, and Spiegel catalogs!! ...Area rugs, beds, bedding, dining sets, dinnerware, curtains, floral arrangements, you name it!! These were all day affairs! My "job"!!! Oh I wish I had the key to this Salt water taffy gem's front door!! Of course there are a few minor changes I would make...but my goodness...you can't beat these sweet bones!